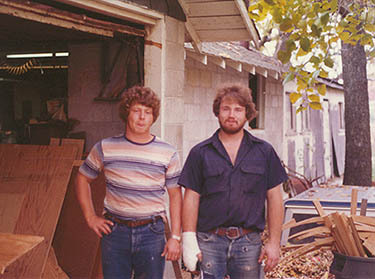 Curt McCoy and John Stark outside MSW in the fall of 1977. At MSW we are proud of our roots and what we have grown to become. MSW began as a single-man operation in 1959 when Ray “Mac” McCoy began building wooden booth frames in a small garage at his home near Joplin, Missouri. In 1975, Ray’s son Curt joined and began to run the daily operations of the business, soon bringing his friend John Stark on board. In the 1980s, Curt and John grew the business dramatically by specializing in serving established and emerging multi-unit restaurant organizations, many of which remain customers today! In the 1990s, they took the business to another level by adding newly available computer controlled machinery and completing a large office and facility expansion. Over the next few decades, several more building expansions became necessary, adding up to nearly 100,000 square feet. Today a third generation is helping to lead the company as we use state of the art technology and machinery to produce the quality and consistent products and services that our customers depend on. We are excited for what the future holds and look forward to growing alongside our valuable customers!